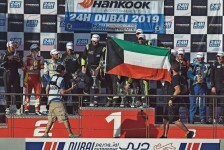 Kuwaiti driver Khaled Al Mudhaf won a 24-hour race in Dubai with his team on the Lamborghini Horican Super Tropez Ivo in the SPX (private cars) category. The German team, which has defended its colors, has succeeded in adopting a successful strategy in order to distribute the roles among the drivers and provide the best performance and spend as much time as possible on the circuit, which is in the interest of the team that brought the first place back home. What to do to win the SPX category. The team also ranked 14th in the overall ranking among the other categories. The race lasted 24 hours, from Friday 3 pm to 3 pm. The distance traveled by the teams during this period is equal to the number of kilometers traveled by Formula One cars throughout the season. Khalid Al Mudhaf said after his victory: "I am very proud to present the first place trophy to my beloved Kuwait. It is a unique and unique race here in the Middle East and one of the biggest races in the world. " "I have participated in this race four times and I have won twice, and this is a great honor for me. The world's most professional drivers are participating in the race, from around the world, so the level of competition is very high. Racing here needs hard work and skill, because there are 80 cars on the track at the same time, and we have succeeded in getting the car to the finish line without any damage thanks to the talent we have as a team. " The Kuwaiti driver, who began his career at the age of 11 years, is particularly successful in the Kuwaiti desert on a MotoCross motorcycle.Khalid is the head of his own Kuwait-based G-Force, founded in 2010. At the age of 14, he has become a Kuwaiti hero before moving to the highest levels of racing to defend the colors of leading brands such as Ferrari, McLaren, Porsche and Lamborghini, competing alongside the most prominent names and most experienced in motor sports.